You can add the picture and few lines of text. The text you see on our ornament is just an example what can be done. Let your creativity flow, we can customize the ornament with a name, year, funny saying, Christmas wish.... or any combination of those. We customize a large 3-1/4 inch white glass Christmas ornament by printing your image and text into one of our pre-designed borders onto a clear band and then affix the banded image permanently to the ornament. Each ornament is individually packaged in a protective, clear display box. We are now offering break resistant Bohemian glass bulbs for an additional $5.00. The Bohemian glass bulbs are thicker and more durable than our standard bulbs and have a deeper and richer hue, making your images even richer looking on the bulbs. If you are ordering more than one ornament and emailing several pictures, be sure to describe each image in your email message: picture named - samantha.jpg goes with Samantha name, picture named MVC1765.JPG goes with Smith family ornament. Please note that there will be a $10.00 surcharge if you require a proof of the completed image prior to production.... and the production will take a few more days than if you do not require the proof. 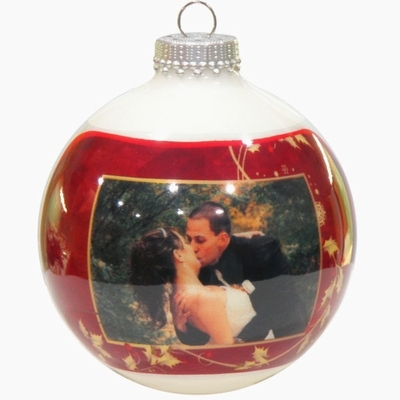 We are so confident with the quality of our photo banded glass Christmas ornaments that we are proud to offer you an unconditional 30 day money back guarantee. You only pay the shipping cost to return the product back to us. If you return the product to us within 30 days of the original date of shipment and prepay the shipping costs back to us, we will be happy to refund the original price of the ornament, as well as the original shipping charges. Each ornament is individually packaged in a protective, clear display box.